I haven’t mentioned much on how my garden has done this summer so I thought I would share. It has been producing more than enough for my families needs so I have been giving the extras to my neighbors. 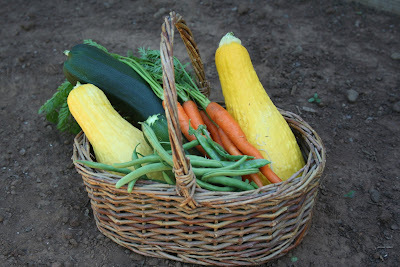 For some reason my zucchini, yellow squash and green beans started producing tons quite early so I have been baking loaves of zucchini bread and have been having plenty of stirfries. The carrots aren’t very plentiful, but when we do pull them out my boys eat them up immediately. Same with the snap peas, which only produce about 3 -6 a day. I have also been picking a few cucumbers. Our raspberry bushes kept us happy for quite a few weeks, then stopped a couple weeks ago, but now our late harvest raspberry bushes have just begun to give us some huge, red berries. Currently, our tomato plants are really producing and this year they are nearly perfect! Last year every single one of my tomatoes rotted at the bottom, but this year I only watered at the base of the plant, which I had heard is the reason for tomato rot, and lo and behold, perfect tomatoes! My friend, Estie, gave me a great recipe using tomatoes and I have been making it non stop. I will post pictures and the recipe as soon as I make it again! I have really enjoyed learning more and more about gardening this year and am glad I expanded a little more than last year. I already have plans to plant for a fall and winter harvest, so we’ll see how that goes. Emily, over at Making Dough, inspired me to plant garlic this month, and considering how easy it sounded I would be silly not to. Then, next year, I’m digging an even larger plot for my garden space and adding potatoes, onions, and whatever else I can think of. Whether or not I have saved money by planting my own garden would not deter me from planting again. Being able to walk out of my kitchen and into the back yard to pick my ingredients for dinner that night, and also knowing that they are fresh and organic, makes it all worth it to me. Cool pics. Love those crazy looking yellow squash and your huge tomatoes!! 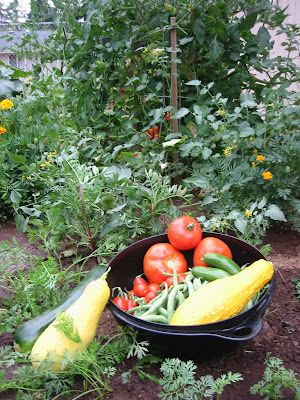 Looks yummy and amazing….I think that the food we grow in our garden tastes so much better! I too want to expand my garden next year. This was our first year planting one at our current house, we had to remove the forest (on a 7500 sq. ft lot) before we could plant anything. We finally have a yard this year! Anyway I think that it is certainly a learning experience and fun for the kids too! LaceyLady – we live in a duplex, but I have no "plantable" ground. My husband built me a very small raised bed at the side of our driveway where I planted tomatoes, but I bought 2 Topsy Turvy's,hung them off the house, and grew green peppers and cucumbers in them instead of tomatoes. Just something to keep in mind for next year. Also, I did not buy mine off TV, but at Walgreens when they were on sale for $7.99, and used RR to help pay for them. You are definitely right about a garden being worth it — and of course, it saves a ton of money on food that is healthy and delicious! I can’t wait for you to post your recipe using tomatoes! I cant wait to have a house w/ a yard. So I can have a garden like yours. I plant tomatos and straberries in pots now on my apartment porch and they actually do pretty good, but no room to expand.